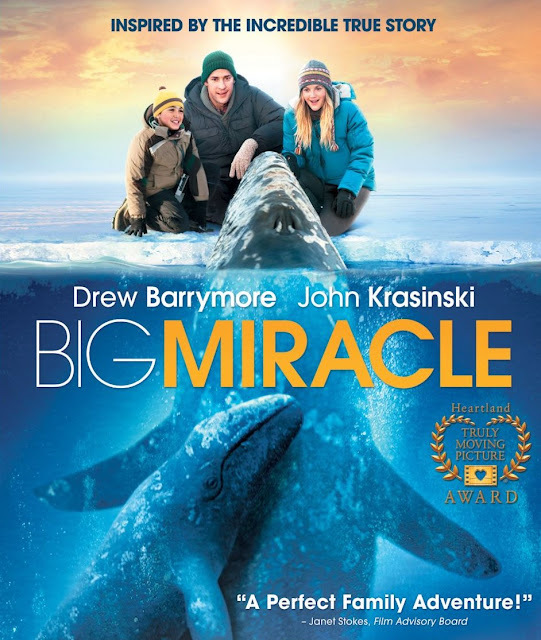 Last night we watched and enjoyed Drew Barrymore and John Krasinski as they retold the true story of three gray whales trapped in the ice in Barrow, Alaska in the movie Big Miracle. As the tagline on the cover of the blu-ray release shown here says, it was the "perfect family adventure," the moving story of people coming together from all walks of life to try to save the stranded whales. This event actually did happen in 1988 if not exactly as portrayed by the movie. This movie was actually inspired by rather than based on the true story. However, if the movie helps people remember the event and think about the plight of the whales then and now, perhaps the changes within the movie are acceptable. Plugged In says, "Big Miracle lauds the inventiveness of the human spirit, points to the value of animal life and challenges the cynic in all of us." The New York Times says, "When people put aside politics and ill will, they can accomplish something they could never manage alone. Big Miracle is savvy enough to allow that many of the people pitching in do so for reasons other than altruism, and it is sentimental enough to have those characters changed by their commitment to the cause." The Movie Mom gives this movie a B+ and outlines what parents need to think about in terms of this movie. There is some swearing as well as peril for humans and for whales. Big Miracle is a nice film and comes recommended by us for anyone looking for a movie about whales and life in Alaska. Order your copy of Big Miracle from Amazon. Looks like a good film I'd like to see. Thanks for reviewing this. You are welcome, Fay. It was a nice movie.